Your eight-hour tour begins by taking you from your hotel into the Columbia River Gorge National Scenic Area where you will see nature's beauty with gorgeous waterfalls like Multnomah Falls, Latourell Falls, and Horsetail Falls. You will also get to visit Vista House, which is considered the crown jewel of the Gorge. After our Gorge excursion, we will drop you at the Portland Spirit where you will take an evening dinner cruise on the Willamette River. After dinner transportation to your hotel is not included. Starting with your pickup from your hotel in the Downtown Portland area at 2pm, you will spend the afternoon at Multnomah Falls and the Columbia River Gorge Waterfalls. 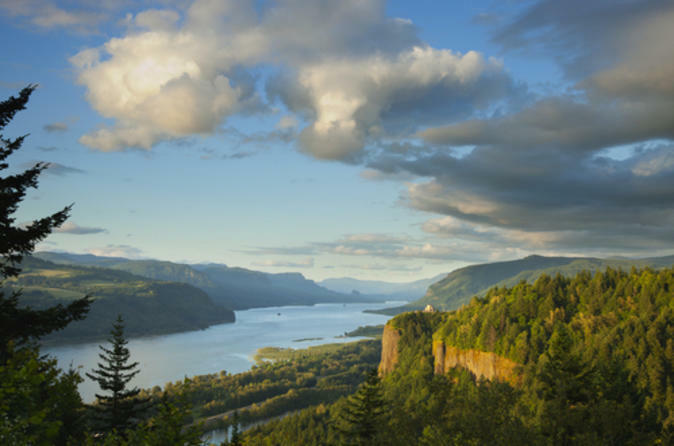 As the tour proceeds, travel the Historic Columbia River Highway Scenic Byway. Along the way, see the Crown Point Vista House, the most popular of the scenic lookouts along the highway that provides a panoramic view of the Columbia River. Latourell Falls plunges 249 feet over a massive wall of columnar basalt, some of the best formations in the Pacific Northwest, before cascading toward the Columbia River. This waterfall is most recognized for the bright yellow lichen adorning the cliff face, a favorite location of many famous photographers. A winding footpath and a bridge lead to an ideal vantage point for the Bridal Veil Falls. These falls consist of two cascades in quick succession along angling rock faces. This waterfall is one of the best-kept secrets in the Columbia River Gorge. People read about it, but rarely get a chance to view the actual waterfall. Upon your return to Portland, you will be dropped off at the Portland Spirit for an evening dinner cruise on the Willamette River. The dinner cruise is a lively setting enhanced by dazzling sights along the riverfront. It will be an evening filled with gourmet cuisine, locally-sourced and prepared fresh on board. Every plated entree is selected by each guest on board, including a house salad, bread, house dessert, fountain soda, coffee, hot tea. This is a two-hour cruise, featuring entertainment, live performances, and live piano music. You can expect to enjoy this tour with up to 13 other people. Once your dinner cruise is over transportation back to your hotel is not included.